Are You Still Annoying With Pets Shedding? Did You Get Fingers Stuck While Cleaning Dog Deshedding Brush? What You Need Is PEEKABOO SELF CLEANING DOG SLICKER BRUSH. WHY PEEKABOO DOG GROOMING brush IS BETTER FOR SHEDDING PETS LOOSE HAIR THAN OTHERS? EASY TO CLEAN: after you finishing dog grooming or deshedding, just simply click the self cleaning button and the bristles retract back into the dog brush, you can remove all the loose hair with a wipe. 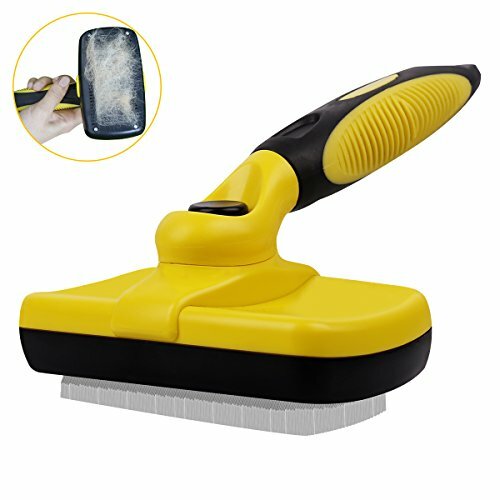 COMFORTABLE&DURABLE HANDLE：PEEKABOO dog shedding brush with ergonomic comfortable grip and anti slip handle, which protect your wrist when you grooming your dogs or cats. KEEP PETS HEALTY AND SMOOTH: our pet grooming brush grooms gently and effectively reduces loose fur for short long thick coat. Grooming like massaging. FOR ALL TYPES HAIR: self cleaning dog grooming slicker brush works great for short and long haired dogs, and removes tangles, knots easily. If there is any problem with our pet grooming brush, you can return it at any time. If you have any questions about this product by Peekaboo, contact us by completing and submitting the form below. If you are looking for a specif part number, please include it with your message. Pet Bath Care Kit Shedding Brush, Large Nail - Claw clipper, Toothbrush, Massage - deshedding Brush, Quick Drying Towel Set includes tools for any size of animal - small medium big dog cat ferret etc.